In 2011, Alberta (62.7%), Saskatchewan (60.8%) and Manitoba (60.8%) had the highest employment rates for youth aged 15 to 24 years. Newfoundland and Labrador (46.3%) had the lowest proportion of 15 to 24 year olds employed within the labour force. 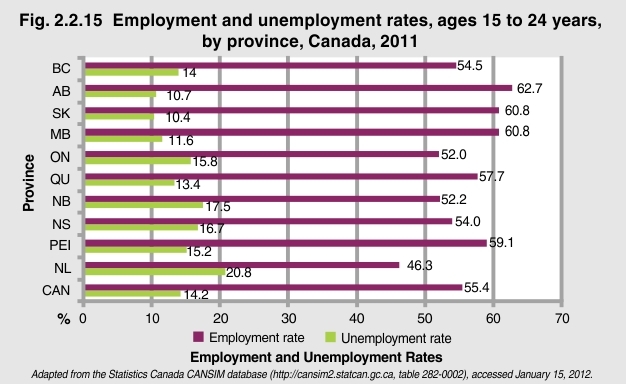 The national employment rate for youth aged 15 to 24 years was 55.4% in 2011. Newfoundland and Labrador (46.3%), Ontario (52.0%), New Brunswick (52.2%), Nova Scotia (54.0%) and British Columbia (54.5%) all had employment rates below the national average.